Expedia Group recently announced that the highest Japanese domestic traveler demand was found in Tokyo in 2018, followed by Osaka, Okinawa, Nagoya and Kyoto. The highest growth was seen in Saitama (+130%), followed by Aomori (+95%), Gifu (+95%), Kochi (+90%) and Ibaraki (+80%). In the inbound travel market, Tokyo, Osaka, Kyoto, Okinawa and Fukuoka saw around 50% growths. Traveler demand in Saitama surprisingly increased by 170%, and high growths were found in Aomori (+110%), Niigata (+90%), Ehime (+85%) and Tottori (+85%). In terms of bookings by international visitors, the highest growth was seen in Indonesia (+230%), followed by Ireland (+200%), Spain (+100%), India (+100%) and Italy (+70%). 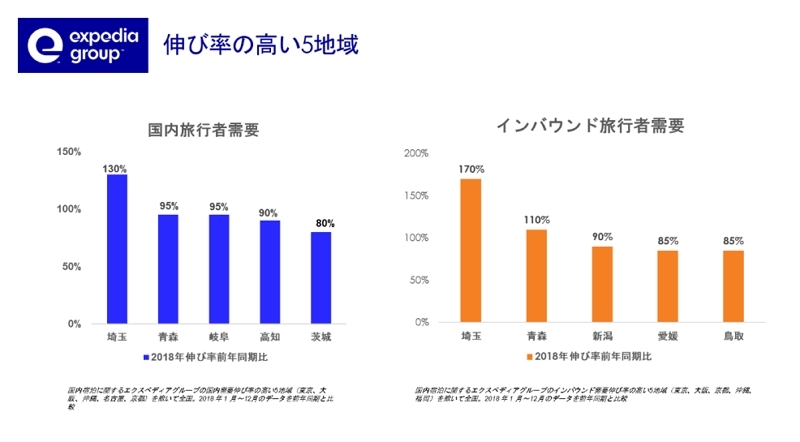 The survey also shows that the ratio of bookings via mobile phones by Japanese travelers reached 50%, which was higher than one-third of the world’s average.